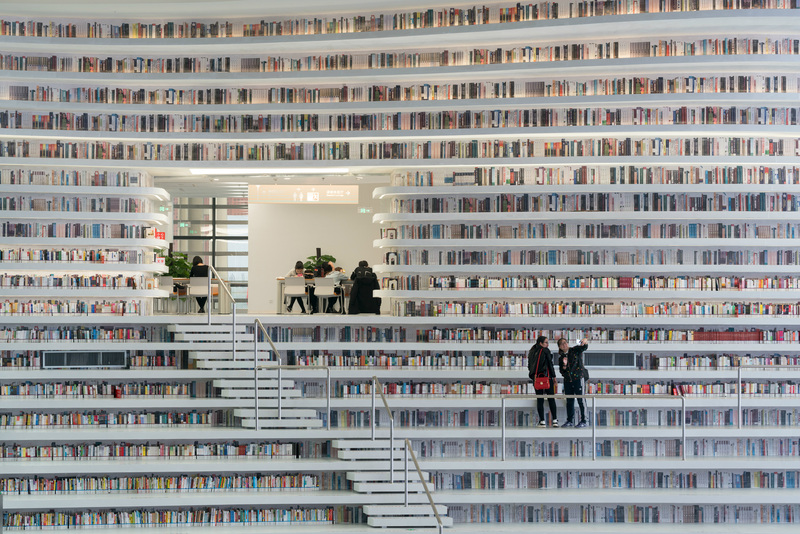 In collaboration with local architects TUPDI, MVRDV have competed the Tianjin Binhai Public Library in a record breaking time of only three years. 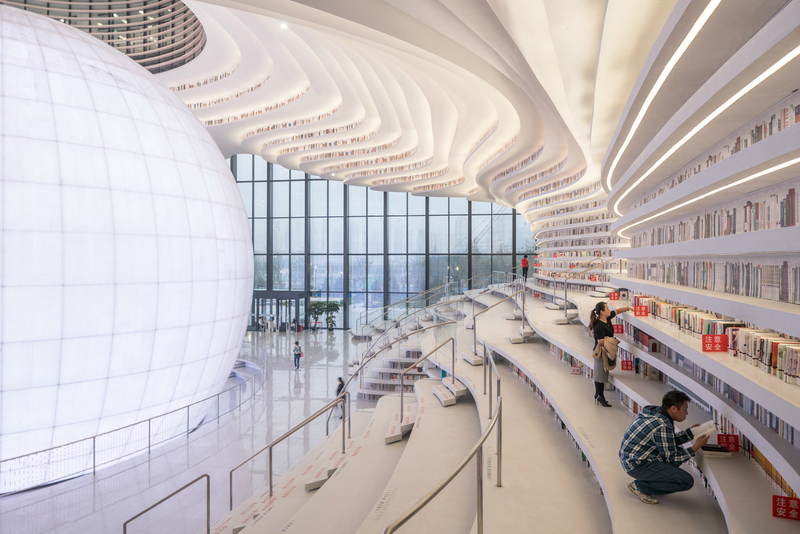 The work of global architecture and urban design firm MVRDV, the Tianjin Binhai Public Library gives the appearance of a giant eye, with floor to ceiling bookcases cascading around a luminous, spherical auditorium. 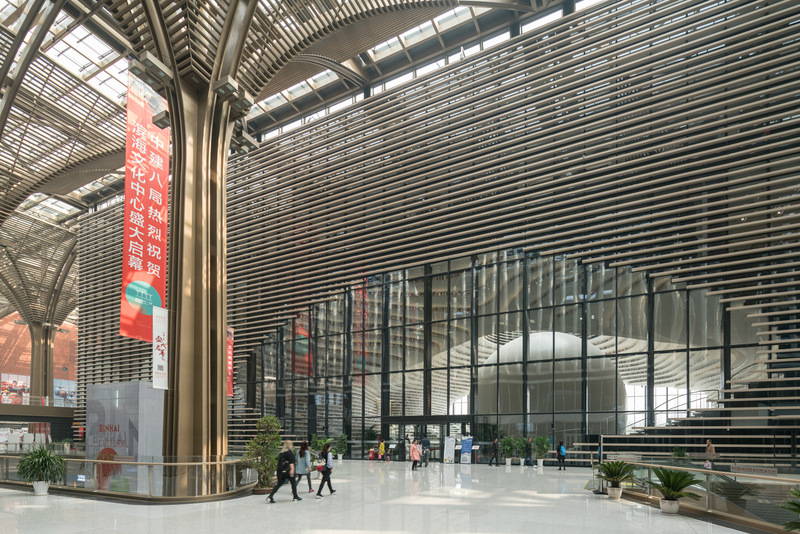 Commissioned by Tianjin Binhai Municipality and located in the cultural centre of Binhai district in Tianjin, China, the Tianjin Binhai Public Library is one of five cultural buildings that have been designed by an international cadre of architects, including Bernard Tschumi Architects, Bing Thom Architects, and HH Design. The cluster of buildings all connect via a public corridor underneath a glass canopy, which was designed by GMP. Due to a tight schedule that was imposed by the municipality, the library was designed and built in a record breaking time of three years, becoming MVRDV’s most rapid, fast-track project to date. Extruding upwards from the site, the library is ‘punctured’ by a spherical auditorium at its centre, whilst bookshelves are arranged on either side of the sphere. These undulating bookshelves are used to frame the space; they have also been adapted to become the stairs and seating, and continue along the ceiling to create a unique interior. A five-level building, the library also holds extensive educational facilities which are accessible through the main atrium. Whilst the first and second floors consist mostly of reading rooms and lounge areas, the upper floors include meeting rooms, offices and two roof top patios. Since opening, the Tianjin Binhai Public Library has been a hit, with reviews describing it as the “most beautiful library” in China (The Bund). 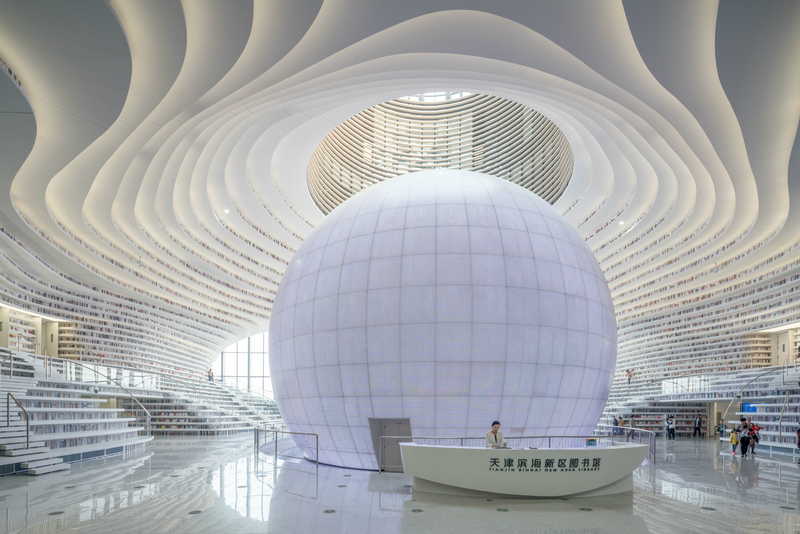 With such a unique public space, it is clear to see why the people of Tianjin have embraced their new library. 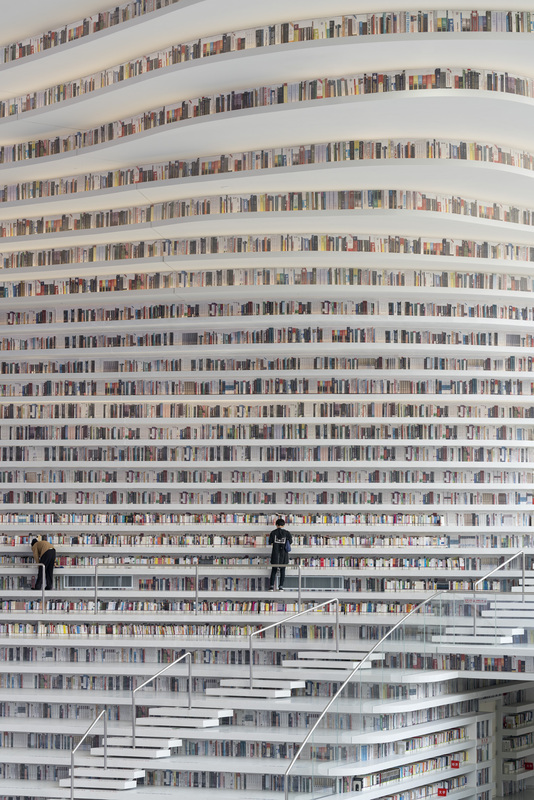 The Tianjin Binhai Public Library is truly a wonder to behold, offering space for over 1 million books - and keeping a ‘watchful eye’ on all that happens around it.